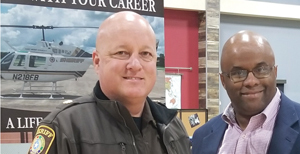 Deputy Sheriff Chad Norvell and Henry Dibrell at a community meeting. Happy Easter and a most joyous Passover Season! I love the spring – so many fun things, fresh air, chirping birds and of course, 7 on 7 football. In this issue, we share some Katy churches and their Easter traditions as it is our traditions that help tie us together as a community. We hope you enjoy reading about these congregations and their Easter traditions. I want to thank each pastor who took the time to share with us. Also, we have another great High School Hot Shot this month. Please take a moment to read about Nikki Ortiz of Tompkins High School. And, our resident attorney Nancy Rommelmann shares some very important law facts with us. If you are married, you must read Nancy’s column on page 12. In our Medical Focus, we learn so much about health care and staying healthy. As I get older, I find myself becoming more interested in ways to stay healthy. Out and About has so many fun photos – check them out to see if there’s anyone you know. Also in What’s Kickin’ in Katy, we have some great events coming up, so take the time to enjoy the beautiful weather and some great events. Have Happy Easter, and remember, school is almost over so it’s time to start planning your summer!